There are a lot of very convenient and very useful home appliances that can quickly become very, very expensive. Meat grinders are among the appliances with the highest potential to cost you and arm and a leg, but there are some simple steps you can take to keep your costs as low as can be. 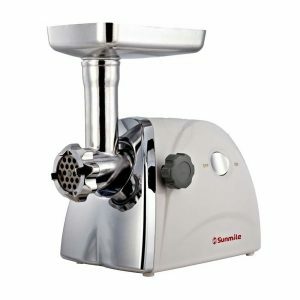 Check out these helpful tips to find out how you can get the most bang for your buck on a meat grinder purchase. 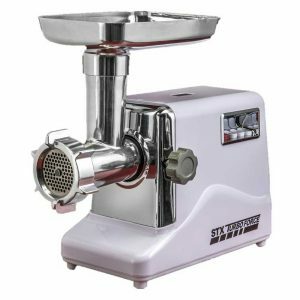 If you really want to keep your spending to an absolute minimum, then your best bet is definitely going to be a manual meat grinders. These models do not have any of the expensive internal motors that drive up the price on other units, since they rely on a simple hand-powered crank system to carry out the actual grinding. 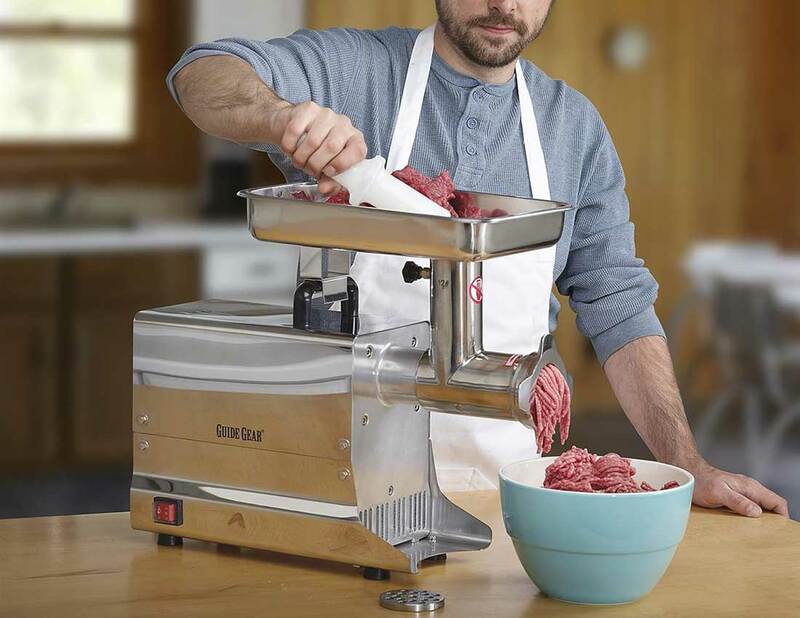 Without all the complicated motors and mechanics in place, you can potentially save hundreds of dollars on the final purchase and still be able to grind your own meats, mince some vegetables, make homemade pasta, and even create your own sausages. 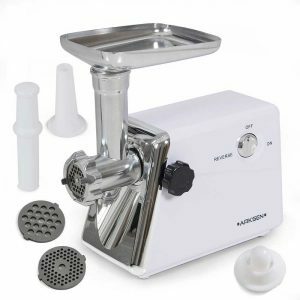 Manual meat grinders are ideal for anyone that is going to have a relatively low yield of meat they need to work with at any given time, since they just don’t have the capacity to work through huge batches as an electric model would. 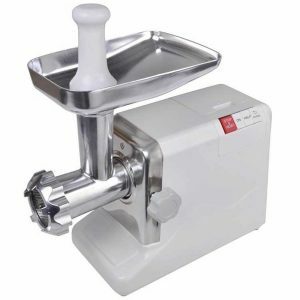 If you’re only planning on using the grinder sparsely, and don’t mind putting in some extra effort to grind the meat yourself, then manual is the way to go. 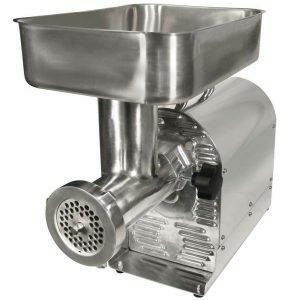 However, if you are thinking about purchasing a meat grinder for bulk food prep, to handle tough meats or simply don’t want to work so hard to get the job done, then a manual model may not be right for you. As you probably already know, sometimes you have to spend a little bit more to get all the features you want in an appliance, and the rewards can most definitely be worth the cost. If it seems like you’re leaning towards an electric model, then there are still several ways to ensure some sizable savings are in your future. 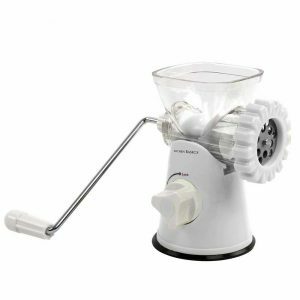 Since the motors are what really has the biggest impact on the final price of an electric meat grinder, the quickest way to drive down the price is to look for models with a less powerful motor. Most grinders measure the motors using a unit of measurement called watts, which track the amount of power that can run through the system. More watts equals more power, and in most cases more money, so you’ll want to look for a unit with a motor that has around 300 watts. This should be the base power, since it’s maximum power rating will be a bit higher. While additional accessories can be very fun to try out and sometimes quite useful, they can also increase the final price of a grinder. There are a lot of models that will give you additional grinding plates or cutting blades, which are definitely the most useful and aren’t likely to increase the price too much. 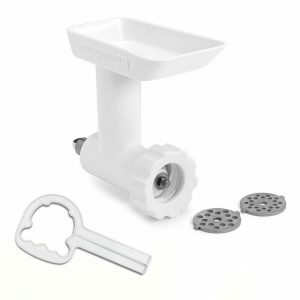 What you want to keep an eye out for are augers, attachments for preparing different types of foods (like sausage makers), or enhancements to the hopper. 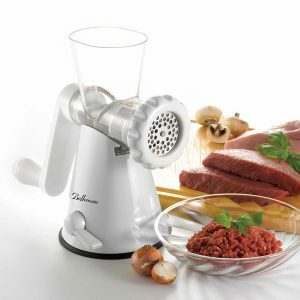 These won’t affect your core ability to grind meat, and can be safely dropped without any lost functionality. As you go over all the different specifications and accessories for each model, don’t forget to keep your own comfort level in mind. 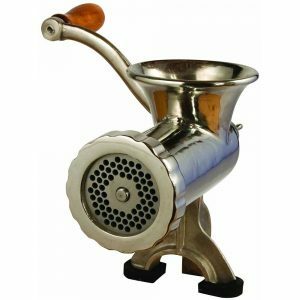 It might not be worth shaving off a few extra dollars if it means making your life harder or taking away from the actual usefulness of your meat grinder.